Let's time-travel back to the 1950s in Phoenix. We're heading north on Central at Van Buren. It's a one-way now, but it wasn't then. Let's look at the buildings. I did this with one of my very best PhDs (Phoenix History Detectives) on Sunday. As we drove along, my tour guide, who saw all of this when it was new, pointed out interesting buildings, and I saw them. Of course they're not all there! Most of them are gone. And so when you find ones that you recognize, like the 1st National Bank Building there (which is now an ASU Building), it's a lot of fun. The grey building on the left with the radio tower is the Westward Ho, and in front of it is the old Post Office building, which like a lot of buildings in downtown Phoenix, are being repurposed by ASU. Behind the Standard Oil Building (I've moved to the right front now), is the Sahara Hotel, which was where Hattie Mosher's house originally was, and is where the ASU Law Building is nowadays. 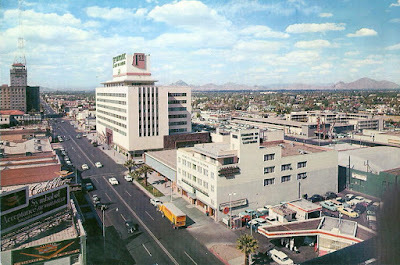 If you lived in Phoenix in the 1970s and later you may remember the Sahara as the Ramada Inn Downtown. Of course, the mountains never change. 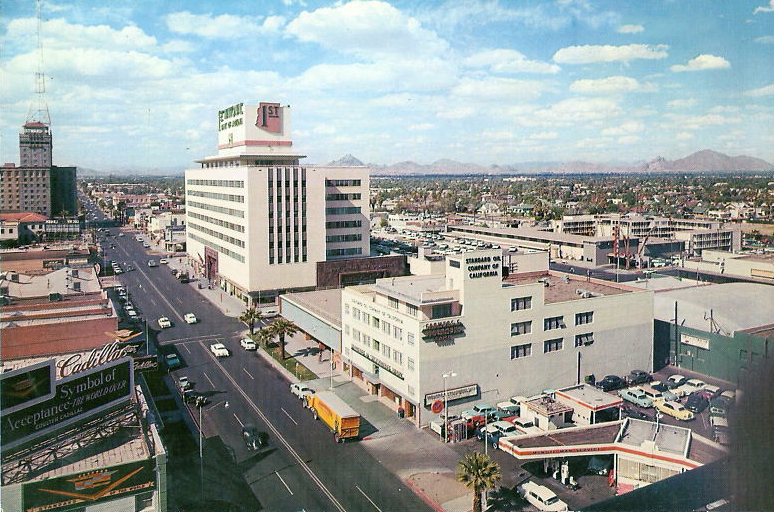 Those are the Phoenix Mountains, with Squaw Peak (now called Piestewa Peak) behind the 1st National Bank Building, and Camelback Mountain to the right. This photo, which is from a 1950s postcard, was taken from the top of the Security Building. Traffic looks pretty light, it was probably a Sunday.